According to his obituary, naming exactly how many years, months and days old he was upon the day of his death, John Peter Winfield was born on September 3, 1832 in what is now Stanly County, North Carolina, along the shores of the Yadkin/PeeDee River north of its confluence with the Rocky River and close to where the Swift Island Ferry would eventually cross. I determined the area from knowing the location of some of the neighbors of his father Peter II, son of Edward, grandson of Peter, great grandson of Edward, son of Jarvis Winfield of Sussex County, Virginia. Peter was shown in the 1830 census near the Kirks, Boysworths, William Craven Thompson and the Meltons, who lived off of what is now Hwy 24/27 between Albemarle and Troy in the Stanly County part of what was then known as the "West PeeDee" part of Montgomery County. Peter is shown in the census as a young man with a young woman and two little boys in his house under the age of 5. This would have been his wife Mary "Polly" Goldston Winfield and two sons. It would make since that these two boys would be William Winfield, born in 1829, and John Peter. However, if John Peter was truly born in 1832, he would not have been counted in the 1830 census, so there may have been another son who died as a child. 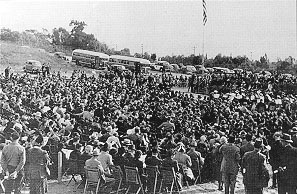 The Grand Opening of the Swift Island Bridge across the Pee Dee River from Stanly to Montgomery Counties in North Carolina in December 1922, courtesy of The Federal Highway Administration. 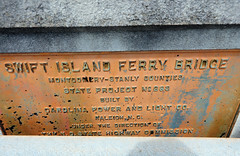 The bridge had to be demolished just a few years later due to construction of a dam downstream near Norwood, NC. Peter died as a young man, at the age of 27, leaving a 21 year old wife and two little boys, William and John Peter. Mary Goldston Winfield, known as many Mary's were by the cub name of 'Polly', was the daughter of Thomas Jefferson Goldston, who had been born in Chatham County where the Goldstons hived, and Lydia "Liddie" Waddell, of Randolph County. Peter was the brother of her first cousin, Mary Louise Burroughs' (Bryan Burroughs and Sally Waddell Burroughs) husband Arthur Freeman Winfield. Polly and Peter had married on November 7, 1825 in Randolph County at the tender age of 16. Robert Barber (1836 - 1863) Civil War casualty as well. George Barber (1842 - 1864) Civil War Casualty. Sidney R Barber (1844 -1911) Died in Lousiana. In the 1850 census, a 20 year old "Peter High" was also living with the family and caused the transcriber to name all of the family "High", but the children were Barbers. By 1860, J P Winfield had married Susanna Virginia Liles, daughter of Jesse Jones Liles and Eleanor Dumas McClendon. They married in 1851, at the ages of 19 and 16. Teenaged marriages were not uncommon in those days, and in fact, necessary, due to the fragility of life and lack of urgent medical care. The average lifespan was much lower than it is today and the infant mortality rate was extremely high. Robert Jesse Winfield 1861 -1947 married cousin Ella Davis, 7 children, married second Annie Knight, 2 children. All living Winfields in the Anson and surrounding counties are descended from the 3 sons of John Peter Winfield who lived to adulthood. Peter's brother Milton died childless and his older brothers John and Freeman migrated to Alabama and Arkansas. When the Confederate Army was formed in 1861, John Peter Winfield met the call to service, along with all of his Barber half-brothers with the exception of William Jones Barber, who was only 13. Even 16 year old Sidney joined up. JP Winfield, along with Robert and George, would loose their lives in the war. Older brother, William Winfield, would die in 1864 of typhoid fever and is buried in the Brown Creek Baptist Church cemetery with his mother and stepfather. Surviving brother James Alfred Barber, would become a minister there later. Location of Brown Creek in comparison with other creeks and counties. Thurs. July 10, 1862 List of Killed and Wounded in Co. C 14th Regiment, as far as known: Killed - Daniel McKay, Frank McLendon, mortally wounded, Jesse Sibley, since dead. Casualties, in PeeDee Wildcats, J P Winfield, in arm, severely. May 30, 1864 Corp. George Barber, Co K, 43rd NC Reg. of Brown Creek. To be buried. John P Winfield of Anson County, aged 32 years, 2 months and 29 days. He was a private in Capt. J McLauchlins Co. K, 26th Regiment of NC troops. In May last, he bid adieu to friends and relatives to go forth in defense of country and loved ones at home. After spending a few weeks in peace and quietude on the tented field, the company had an engagement with the enemy in which engagement he was instantly killed by a shell. He leaves a wife and four children besides many other friends and relations to mourn his untimely loss. I would say to them, weep not, believe that he has changed a world of wars, for one of eternal bliss. In August of 1836, he made a public profession of religion, joined the church and was baptized. He was a consistent member up to the day on which he was killed. We all have reason to believe he was nearly a pure Christian as this earth affords. And I doubt not that he is to-day on the peaceful shores of eternal happiness, singing praises to God, with those who have gone before him. May those left behind prepare to meet him. S.F. Gathings, slightly wounded in the breast. tree by a shell. E. Hildreth is missing, but it is thought will come up yet. instantly, George Bowman. J.P. Winfield and H. Willoughby, were wounded slightly. The regiment suffered 8 killed, 61 wounded, 5 missing, 3 wounded have since died.